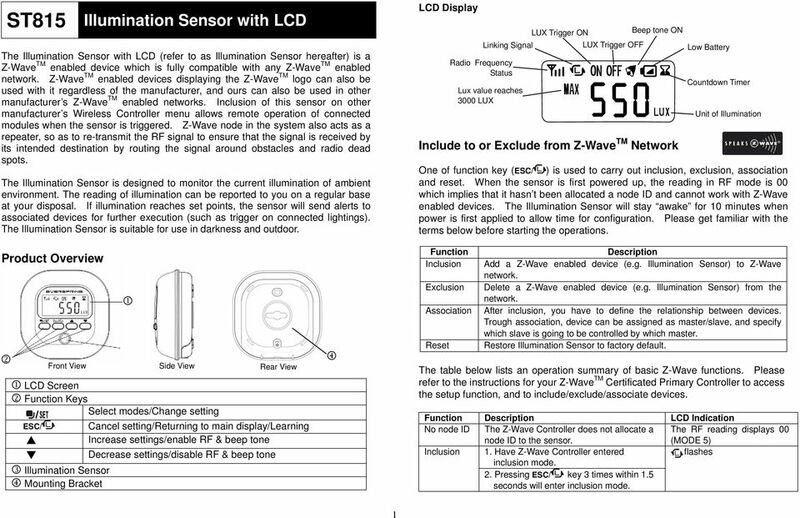 Download "ST815 Illumination Sensor with LCD"
5 If no key has been pressed, it will return to MODE 1 automatically after 12 seconds. While you are setting the sensor, the function of detecting trigger-off is set to disable to avoid false detection (because hands may obstruct the light to Illumination Sensor during setting). 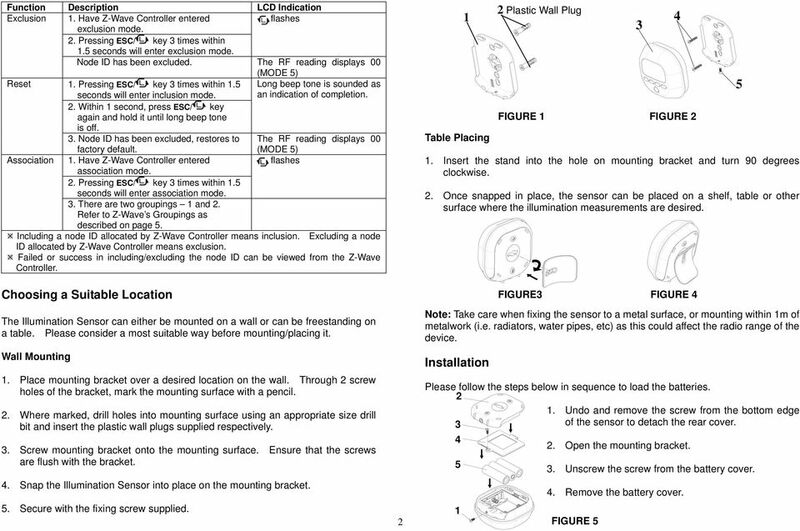 The sensor must be placed still for 12 seconds for the detecting function to be enabled again. If trigger-off value is preset and the sensor is re-powered, it will take 1 seconds before the detecting function is enabled. 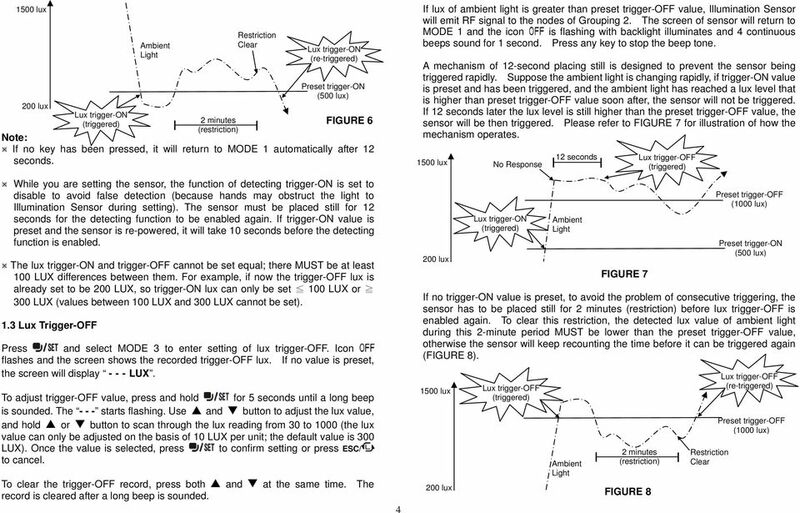 The lux trigger-on and trigger-off cannot be set equal; there MUST be at least 1 LUX differences between them. For example, if now the trigger-on lux is already set to be 2 LUX, so trigger-off lux can only be set 1 LUX or 3 LUX (values between 1 LUX and 3 LUX cannot be set). 2. Countdown Timer Press and select MODE 4 to enter setting of countdown time. Icon flashes and the screen shows the recorded countdown time. If no value is preset, the screen will display - : - -. To adjust countdown time, press and hold for 5 seconds until a long beep is sounded. The hour starts flashing. Hour Minute Use and button to adjust the countdown time, and hold or button to scan through the time from 1 hour to 8 hours. Press to set minutes, and hold or button to scan through the time from 1 minute to 6 minutes. Once the value is selected, press to confirm setting or press ESC/ to cancel. To clear the last countdown time record, press both and at the same time. The record is cleared after a long beep is sounded. Countdown timer starts counting ONLY when the trigger-on lux is triggered. No response will be made if sensor is triggered ON again during countdown period. Wait till countdown is completed before restarting the trigger-on function. Once countdown is completed, icon flashes on the screen with LCD backlight on and 4 continuous beeps sound for 1 second. The sensor will emit RF signal to the nodes in Grouping 2. The sensor has to be place still for 2 minutes before lux trigger-on is enabled again. 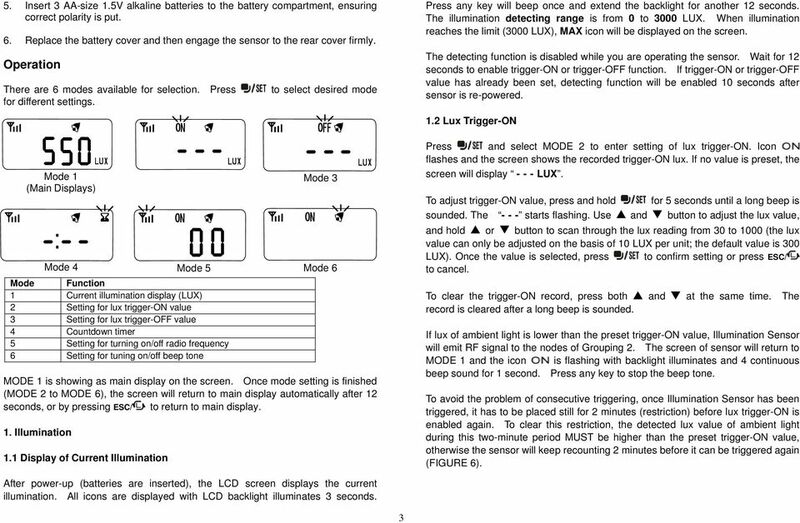 To clear this restriction, the detected lux of ambient 5 light during this 2 minutes period MUST be higher than the preset trigger-on value, otherwise the sensor will keep recounting for 2 minutes before it can be triggered again. If no key has been pressed, it will return to MODE 1 automatically after 12 seconds. While you are setting the sensor, the function of detecting trigger-on is set to disable to avoid false detection. The countdown bias is about ±1%. 3. Radio Frequency This function is designed to enable or disable the sending function of RF command to the associated nodes in Grouping 2 once Illumination Sensor has been triggered ON/OFF. Press and select MODE 5, the icon should flash. Press to turn On (enable) the function or to turn OFF (disable) the function. 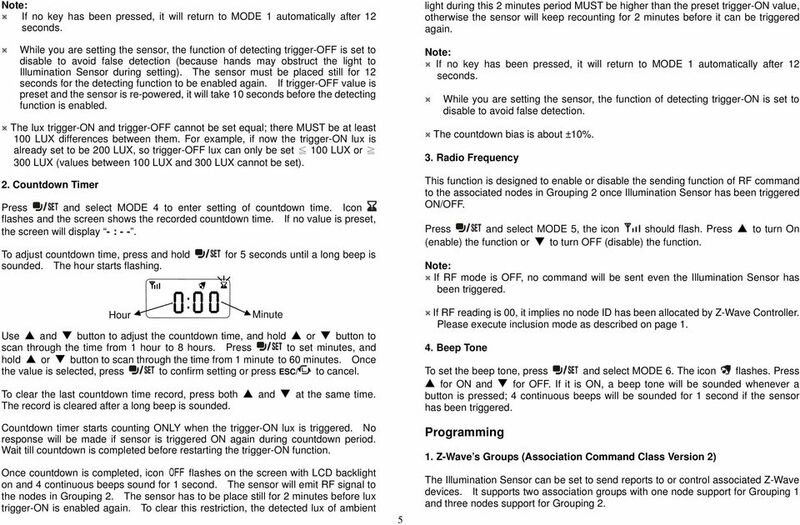 If RF mode is OFF, no command will be sent even the Illumination Sensor has been triggered. If RF reading is, it implies no node ID has been allocated by Z-Wave Controller. Please execute inclusion mode as described on page Beep Tone To set the beep tone, press and select MODE 6. The icon flashes. Press for ON and for OFF. If it is ON, a beep tone will be sounded whenever a button is pressed; 4 continuous beeps will be sounded for 1 second if the sensor has been triggered. Programming 1. 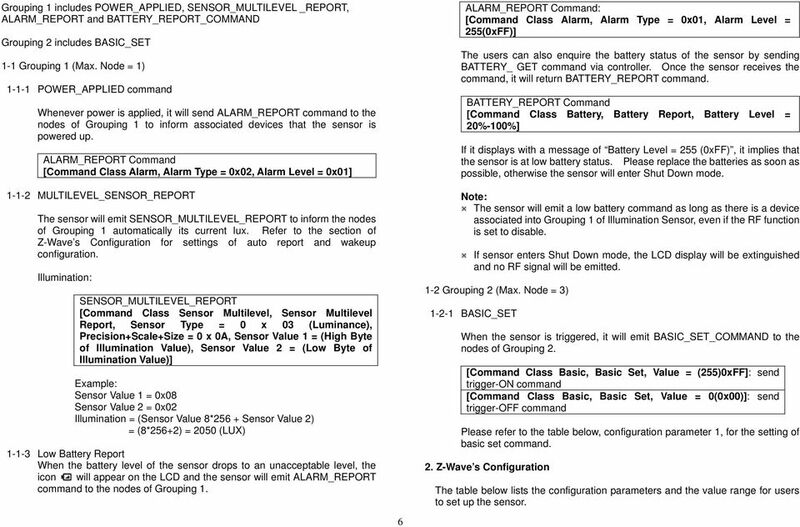 Z-Wave s Groups (Association Command Class Version 2) The Illumination Sensor can be set to send reports to or control associated Z-Wave devices. It supports two association groups with one node support for Grouping 1 and three nodes support for Grouping 2. 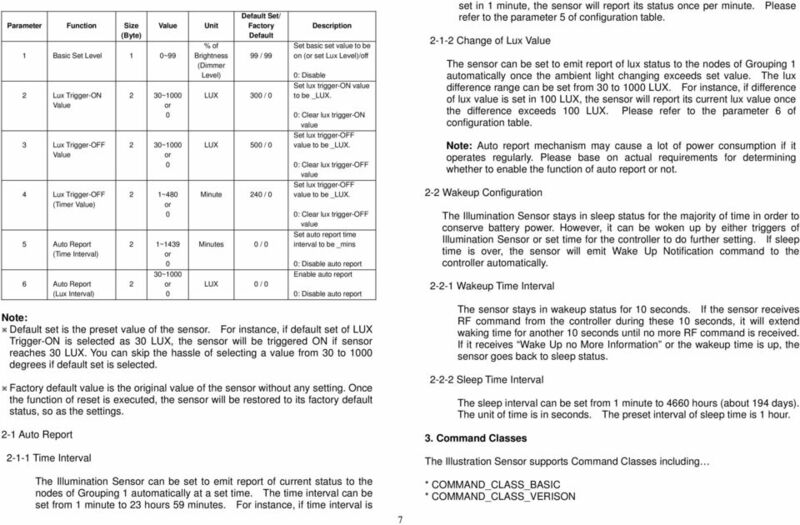 8 * COMMAND_CLASS_BATTERY * COMMAND_CLASS_WAKE_UP_V2 * COMMAND_CLASS_CONFIGURATION * COMMAND_CLASS_ASSOCIATION_V2 * COMMAND_CLASS_MANUFACTURER_SPECIFIC * COMMAND_CLASS_SENSOR_MULTILEVEL Troubleshooting Symptom Possible Cause Recommendation LCD cannot be displayed 1. Run out of battery 1. Replace a new battery power. 2. Refit the battery with correct 2. Check if reverse battery polarity polarity Illumination Sensor reading is inaccurate Specifications Operating Frequency Illumination Detecting Range Luminance Unit Protection Degree Error Range Battery Type Operating Range Pressing buttons are damaged The sensor is out of order ZDK Version V5.2 Do not open the sensor; send it to the local retailer. 1. Please leave the sensor without operating or do any setting for a period 2. Do not open the sensor; send it to the local retailer. This product does not provide exact reading; the reading of lux value is used for your reference only for environmental illumination setting (ST815-1) / (ST815-2) ~ 3 LUX LUX IP44 (indoor & outdoor use) > 1 LUX ± 32 LUX < 1 LUX ± 2 LUX 1.5V x 3 Alkaline/AA type battery Up to 3 meters line of sight (indoor) *Specifications are subject to change without notice A R Federal Communication Commission Interference Statement This equipment has been tested and found to comply with the limits for a Class B digital device, pursuant to Part 15 of the FCC Rules. These limits are designed to provide reasonable protection against harmful interference in a residential installation. This equipment generates, uses and can radiate radio frequency energy and, if not installed and used in accordance with the instructions, may cause harmful interference to radio communications. However, there is no guarantee that interference will not occur in a particular installation. If this equipment does cause harmful interference to radio or television reception, which can be determined by turning the equipment off and on, the user is encouraged to try to correct the interference by one of the following measures: - Reorient or relocate the receiving antenna. - Increase the separation between the equipment and receiver. - Connect the equipment into an outlet on a circuit different from that to which the receiver is connected. - Consult the dealer or an experienced radio/tv technician for help. 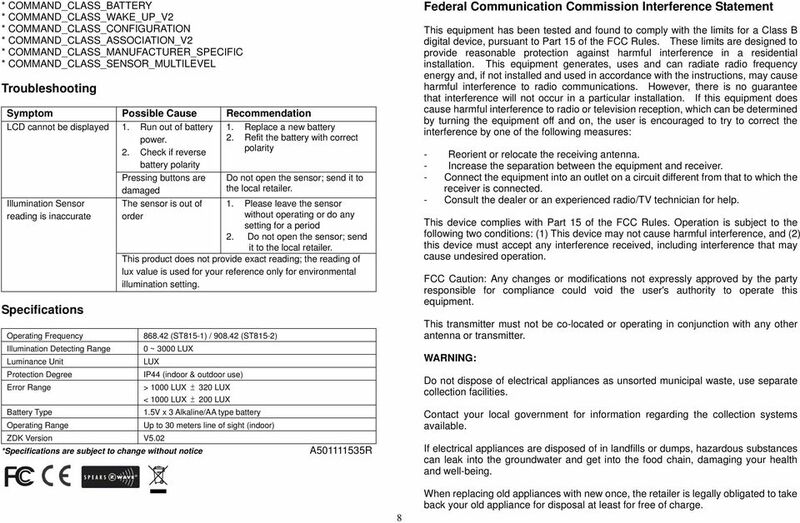 This device complies with Part 15 of the FCC Rules. Operation is subject to the following two conditions: (1) This device may not cause harmful interference, and (2) this device must accept any interference received, including interference that may cause undesired operation. FCC Caution: Any changes or modifications not expressly approved by the party responsible for compliance could void the user's authority to operate this equipment. This transmitter must not be co-located or operating in conjunction with any other antenna or transmitter. WARNING: Do not dispose of electrical appliances as unsorted municipal waste, use separate collection facilities. Contact your local government for information regarding the collection systems available. If electrical appliances are disposed of in landfills or dumps, hazardous substances can leak into the groundwater and get into the food chain, damaging your health and well-being. 8 When replacing old appliances with new once, the retailer is legally obligated to take back your old appliance for disposal at least for free of charge. Please refer to the chapters below for detailed information about all aspects of the products usage. Z-Wave.Me Wall Controller ZME_06443: Wall Controller Firmware Version 1.1 1 General Information about Z- Wave Safe: Generally radio systems build a direct link between the transmitter and the receiver.